As already discussed, much can be gained by comparing the themes in the “Nephite prophetic view” with Nephi's quotes from Isaiah.1 The fourth and final stage of the Nephite prophetic view “discloses the events and conditions that will prevail at the end times.”2 The main themes are God’s ultimate victory over evil, the reward of the righteous, and punishment of the wicked. In the final phase of his sweeping vision, Nephi saw “the Lamb of God in that day that he shall manifest himself unto them in word, and also in power, in very deed, unto the taking away of their stumbling blocks” (1 Nephi 14:1). He also saw that the righteous Gentiles “shall be a blessed people upon the promised land forever,” that “the house of Israel shall no more be confounded” (1 Nephi 14:2), and that the great and abominable church will be destroyed (1 Nephi 14:3). These themes are repeated throughout 1 Nephi 14. 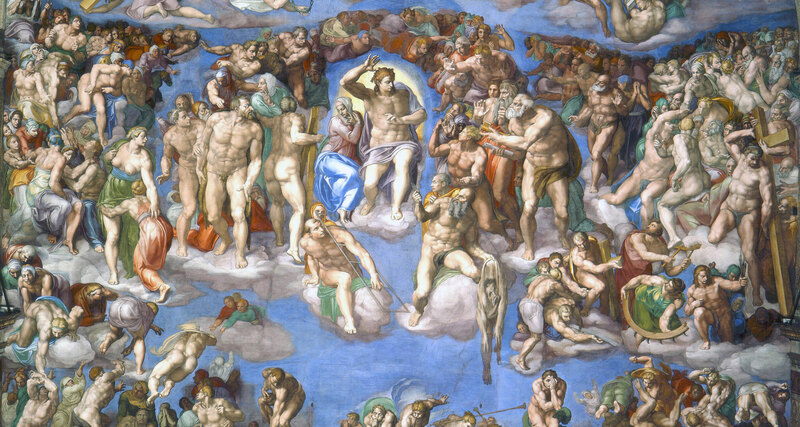 The final judgment of the Lord is also a frequent theme in Isaiah and is scattered throughout the Isaiah chapters Nephi quoted. Nephi’s long block quote of Isaiah begins with a prophecy about the “the last days, when the mountain of the Lord’s house shall be established” (2 Nephi 12:2; Isaiah 2:2).3 Here, Isaiah described the Lord establishing his kingdom (2 Nephi 12:1–5) and punishments to befall idol worshippers (2 Nephi 12:6–11; Isaiah 2:6–11). Several other Isaiah passages from 2 Nephi 12–24 (Isaiah 2–14) could be mentioned in this regard. In particular, Isaiah 14:19 (2 Nephi 24:19) describes the wicked as “an abominable branch.” Might this not have brought to Nephi’s mind the great and abominable church from his vision? Or the great and spacious building from his father’s dream, all which surrounded the great tree of eternal life? Several prophets have described the events that will transpire in the last days. But in Nephi’s world, the prophet who had spoken most similarly to his vision of that future day was Isaiah. So, Nephi unsurprisingly, through careful selection off material from Isaiah, used him as a second witness, attesting that in the end the Lord will prevail, the righteous will be rewarded, and the wicked will be destroyed. Nephi’s fairly straightforward description of this process in 1 Nephi 14 helps readers better detect this pattern in the apocalyptic passages of Isaiah, which Nephi uses in 2 Nephi 12–24. Reading Isaiah’s more cryptic prose with the aid of Nephi’s prophecies clarifies and illuminates the teachings on the final judgment, God’s ultimate triumph, and the rewards or fates awaiting the righteous and wicked. Dallin H. Oaks pointed out, “the Lord declares that some of these signs are His voice calling His people to repentance.” Elder Oaks taught, “We need to make both temporal and spiritual preparation for the events prophesied at the time of the Second Coming.”8 The need for spiritual preparation constantly grows in this increasingly secular world. Prophets both ancient and modern have warned of impending dangers of the last days but have also marked the safe way forward. Book of Mormon Central, “What Vision Guides Nephi’s Choice of Isaiah Chapters?” KnoWhy 38 (February 22, 2016). Book of Mormon Central, “How Did Nephi Read Isaiah as a Witness of Christ's Coming? (2 Nephi 17:14),” KnoWhy 40 (February 24, 2016). Book of Mormon Central, “Why Do Early Nephite Prophets Speak about the Scattering of Israel? (2 Nephi 25:15),” KnoWhy 42 (February 26, 2016). Book of Mormon Central, “What is the Day of the Gentiles? (1 Nephi 21:22),” KnoWhy 44 (March 1, 2016). Dallin H. Oaks, “Preparation for the Second Coming,” address given at the April 2004 General Conference, online at lds.org. John W. Welch, “Getting Through Isaiah with the Help of the Nephite Prophetic View,” in Isaiah in the Book of Mormon, ed. Donald W. Parry and John W. Welch (Provo, UT: FARMS, 1998), 19–45. 1. Book of Mormon Central, “What Vision Guides Nephi’s Choice of Isaiah Chapters? (2 Nephi 11:2)” KnoWhy 38 (February 22, 2016); Book of Mormon Central, “How Did Nephi Read Isaiah as a Witness of Christ’s Coming? (2 Nephi 17:14),” KnoWhy 40 (February 24, 2016); Book of Mormon Central, “Why Do Early Nephite Prophets Speak about the Scattering of Israel? (2 Nephi 25:15),” KnoWhy 42 (February 26, 2016); Book of Mormon Central, “What is the Day of the Gentiles? (1 Nephi 21:22),” KnoWhy 44 (March 1, 2016). 2. John W. Welch, “Getting Through Isaiah with the Help of the Nephite Prophetic View,” in Isaiah in the Book of Mormon, ed. Donald W. Parry and John W. Welch (Provo, UT: FARMS, 1998), 22. 3. See Book of Mormon Central, “Has the Prophecy of the Lord’s House Established in the Mountains been Fulfilled? (2 Nephi 12:2),” KnoWhy 41 (February 23, 2016). 4. Welch, “Getting Through Isaiah,” 29–30. 5. See, for example, Ezra Taft Benson, “Prepare Yourself for the Great Day of the Lord,” New Era (May 1982); Dallin H. Oaks, “Preparation for the Second Coming,” address given at the April 2004 General Conference; both online at lds.org.